“There! That is the sign for which I was waiting.” -Pope St Pius X after hearing about the holy life of little Nellie. A few months later in 1910 he issued “Quam Singulari” which significantly lowered the age of Holy Communion for children. 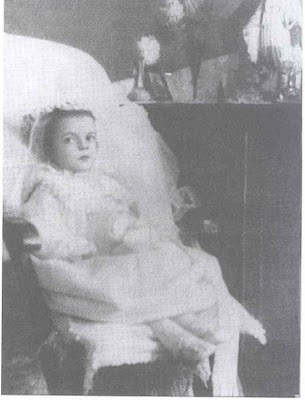 Little Nellie Organ lived to be only four and one-half years old, and yet for very good reason she is known as “The Little Violet of the Blessed Sacrament.” The remarkable story of her short yet holy life begins with her birth on August 24, 1903. 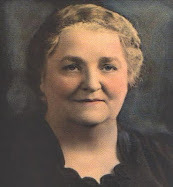 Her father, William Organ and her mother Mary Aherne Organ were married on July 4, 1896 and their marriage was soon blessed with four children: Thomas, David, Mary and, lastly, Nellie. Because unemployment was very high at that time in Ireland, her father William Organ had to choose between emigration and enlistment as a soldier. He chose the latter and in October, 1897, he joined the British Army then in occupation in Ireland, in a garrison in the maritime town of Waterford. Thus little Nellie was born on August 24, 1903, in the "married quarters" of the Royal Infantry Barracks in Waterford, Ireland. Soon afterward she was brought to the parish Church of the Trinity where she was Baptized with the name of "Ellen," though she would be familiarly called "Nellie." "When only two," Nellie's father writes, "she would clasp my hand and toddle off to Mass, prattling all the way about Holy God. That was the way she always spoke of God, and I do not know where she could have learned it." Nellie loved her father dearly, and her first request when her mother went out was to buy a rosary for Daddy. One night her father said he was going on sentinel duty. Nellie said, "I will be sentinel in your place." "No," said Nellie, "I shall wait for you"-and when he returned some hours later she was awake, waiting for him. The holy names were the first words that Nellie learned, and at night the family Rosary was said. Her mother taught her to kiss the crucifix and the large beads, a habit which Nellie retained. In 1905 the family moved to Spike, an island fort situated in Cork Harbor. The mother's health, which had never been robust, now visibly deteriorated. Pious and devout, Mrs. Organ turned in her last months entirely to God, and her rosary was never out of her hands. Toward the end she clung to Nellie with such transports of affection that the child had to be torn, almost rudely, from her dying embrace. She died of consumption (tuberculosis) in January, 1907. The eldest of the Organ children was only nine at the time and her father was engaged throughout the day in his military duties, so initially a charitable neighbor gave occasional help in the Organ household. However since the children were so young and couldn't help much with all the necessary household duties, it was soon realized that this makeshift arrangement was a poor one, and in addition it was discovered that Nellie was painfully delicate and was requiring special care, for it was soon discovered that she had a crooked spine, though this was not recognized completely until she came into the care of the Good Shepherd Sisters. Sitting upright in a chair was painful for her and in fact holding her body still for any length of time pained her a great deal. Her hip and her twisted back were out of joint. She cried, but there was no loving mother to soothe and comfort her. 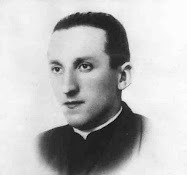 Nellie's father at length realized that he could not carryon any longer in a motherless family, so he asked a kind priest friend to find a home in some convent for his forlorn orphans. The priest friend came to his assistance, and with his kind help each of the little ones was provided with a home in the charitable institutions of the diocese. Thomas was sent to the School of the Brothers of Charity at Upton; David, the younger brother, to the convent school of the Sisters of Mercy, Passage West; and it was arranged that Mary and Nellie should be sent to live at St. Finbarr's Industrial School conducted by the Sisters of the Good Shepherd at Sunday's Well, in the city of Cork, Ireland. 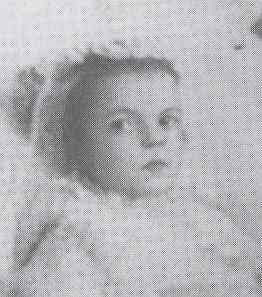 Nellie and her sister arrived on May 11th, 1907. It was with truly maternal care that Mary and Nellie were surrounded there by the kind Good Shepherd Sister and Nellie was truly happy there, and she called all the Sisters "Mothers." Upon her arrival Nellie was three years and nine months old; she would live the remaining eight months of her life with the Sisters. Mary Long was a young girl who slept next to Nellie and she told the Sisters that Nellie seemed to be in pain and would often be up much of the night crying and often coughing. Because of this, little Nellie was transferred to the school infirmary where she would share her meals with a little black kitten, of which she grew very fond and which fully reciprocated the child's affection. While classroom lessons had now ceased for the suffering child, she was however taken at times join the kindergarten games on the playground. One day she was given a box of beads string. She put some in her mouth and inadvertently she somehow swallowed, or rather half swallowed them. They stuck in her throat and she seemed to be suffocating. The teacher snatched her up and went running to find the nurse and together they rushed Nellie into the Sacred Heart Infirmary on the convent ground, and immediately those present performed the operation of extracting the beads from her throat. Five were removed from the neighborhood of the trachea. Remarkably, Nellie did not cry during the painful experience, but sometime later she became listless, so they sent for the doctor. With grief in their hearts they soon heard his diagnosis: Along with her crooked spine Nellie was the victim of the dreaded tuberculosis--the disease that had proved fatal to her mother. Since the disease was already quite along in its progress, the doctor held out no hope whatsoever of her recovery. In fact he informed them that she had only a few months of life remaining. 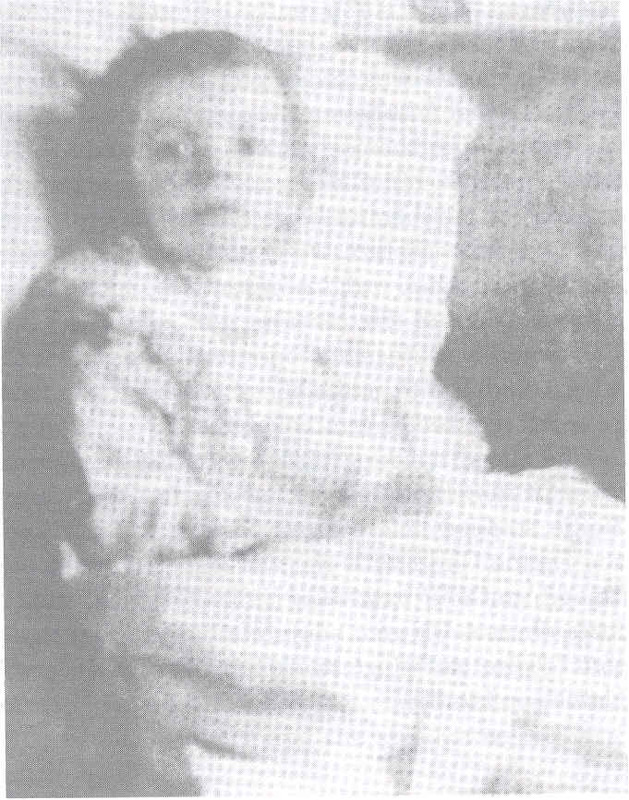 Little Nellie remained for two months in the Sacred Heart Infirmary. 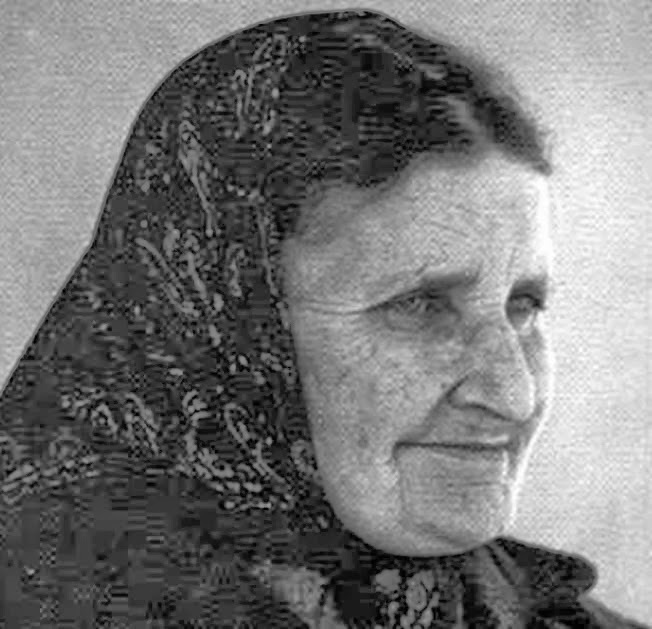 Her nurse, Miss Hall frequently considered it necessary to stay the night with her, and Nellie's gratitude for this attention was full of childlike love---"Holy God took my Mudder," she would say, "but He has given me you to be my Mudder." She would put out her tiny hand between the rails of her crib to take that of her "Mudder," and she would clasp it affectionately until the little fingers gradually relaxed and she fell into a fitful sleep. During this time when Nellie was still confined to bed in the infirmary, a little altar on which stood a statue of the Holy Infant of Prague attracted her attention. She asked Miss Hall about the statue and she explained to Nellie that the statue was an image of Our Lord when He was a child. Immediately Nellie's interest was aroused. Miss Hall proceeded to narrate the story of the birth of Christ and His great love for us. The child listened with evident enthusiasm, and ever afterward she delighted in "the story of Holy God when He was a little child." And from that moment she turned with all the sweet simplicity of childhood and spoke to little Jesus, and at the suggestion of the nuns she soon made a novena to Him, asking Him to make her well. When the novena was ended, she unexpectedly became so far recovered as to be able to walk about in the garden holding someone's hand. Naturally, this inspired in her a great confidence in the Holy Child, with whom she now began to chat familiarly and of whom she made the most extraordinary demands. When, shortly afterwards her former nurse, Miss Hall became unwell, Nellie called one of the older girls and said to her, "Go and bring me Holy God (referring to the statue of the Infant Jesus), and put Him on the chair near me. I want to ask Him to make Mudder better. He made me better, you know." "I will give it to you, Nellie, but please do not break it or Mother Francis will be angry." As the months passed, Nellie soon became ill once again. Often the good Sisters brought flowers to Nellie to brighten her up during her dreary days of illness. "Isn't Holy God good," she would say, "to have made such lovely flowers for me?" Because of this fact she disliked artificial flowers. "They are too 'tiff (stiff)," she used to say; "bring me some of Holy God's own flowers." One day Mary Long, on reaching the door of the infirmary, was surprised to find Nellie scrambling back into bed, in her hand a flower which she had evidently taken from a vase that stood on a table nearby. Perceiving Mary, Nellie slipped the flower under the bed clothes, believing her action to be unobserved. But Mary had seen it and began questioning the child: "Who stole that lovely daisy from the vase?" "Then where is it? Perhaps it is under the bed?" -and Mary pretended to be searching about for it. With a shriek of laughter, Nellie suddenly produced it from its hiding place, smiling all the while. "Oh, you naughty child," said the girl, pretending to be angry, “I'll tell Mother when she comes back that you stole the flower." Nellie did not answer for a moment but hugged the flower to her breast, then quietly remarked that the altar was hers (and thus in her little mind the flower was hers also). Later, when she was alone with Mary, Nellie said to her: "Mudder, I'm sorry I took the flower; but I was only talking to Holy God, and Him gave me the flower…Him did, Mudder." Once Nellie noticed some dead flowers by the Sacred Heart statue outside the infirmary. She spoke up: "Look at them dirty flowers, them should be taken away." 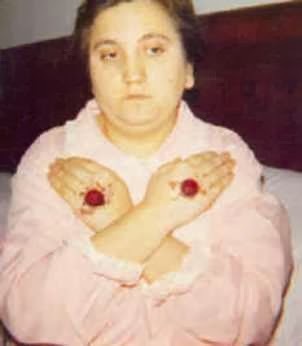 Long afterwards, when she was so weak that she could not leave her bed, she asked Reverend Mother whether "them dirty flowers" had been taken away from the statue of Holy God. With her various household tasks, Mary Long did not always feel able to rise for the community Mass each morning. On one such occasion, Mary began doing her morning work quietly in the kitchen until she heard the children pass into their refectory after Mass. Then she opened the door to Nellie's room and said, "Well, Nellie, how are you today?" To her surprise, Nellie answered reproachfully, "You did not get Holy God this morning." "You did not get Holy God today." "How do you know, lovey?" said Mary. "Didn't you hear me close the door?" "No matter," said the child, "I know you didn't get Holy God." 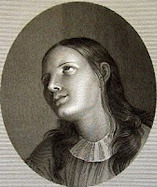 Nurse Hall gave the following account of Nellie's extraordinary behavior on the occasion of her first visit to the chapel during Exposition of the Blessed Sacrament. On that morning, Nurse Hall carried Nellie down to the chapel. Nellie had never before actually seen the Sacred Host exposed in the monstrance. What then was Miss Hall's surprise to hear the little one say to her in an awed whisper: "Mudder, there He is, there is Holy God! And with her little hand she pointed to the monstrance, after which she never once took her eyes off the Host, while an expression of ecstasy transfigured her face. In another account of this same first visit, Reverend Mother writes: "It was the First Friday of the month (October), I was passing along the corridor, when the chapel door opened and Nellie, holding the Nurse's hand, toddled out softly and recollectedly. Remembering how ill the child had been, I stooped down, one knee on the floor, and said: 'Well, how is Baby today?' For answer the little one laid her face on my shoulder and wept silently; but her tears were not sad, they were all sweetness; it was a holy emotion, the happiness of which overflowed in wordless weeping. In that moment," continues the Mother solemnly, "it was made known to me interiorly that God had some special designs on the child, and that I, then Superior, was expected to co-operate with Him in accomplishing them." From that day onward, by some interior warning, without a single exterior sign to guide her, Nellie always knew when there was Exposition at the convent. Nellie had been born in the army barracks, where the prison was called the "lock-up." So concerning the Eucharist in the Tabernacle she regarded Jesus as the "Prisoner" in the “lockup”. Thus on Exposition days she would say: "Take me down to the chapel. I know that Holy God is not in the lockup today." Oftentimes she would call the Eucharist “the hidden Jesus”. There came a time when Nellie's appetite, always small, seemed to fail completely. She would hold her little bowl of broth or milk, turning and turning the spoon about in it, but refusing to eat. When pressed to swallow some, she tried to comply, but swallowing evidently hurt her; and she would shake her head and say her "t'roat" was sore. The doctor was called to examine Nellie's throat but could find nothing wrong. Nellie heard his opinion calmly, did not cry over it and neither over her pain, but continued to assert nevertheless that her "t'roat" was sore. Finally the little mouth was explored thoroughly, and a new tooth was discovered that had just cut its way through at the root of the tongue -entirely in the wrong place, of course. It was soon discovered that poor Nellie had a diseased jaw; and the tooth, cutting through at such a point, must have caused her very serious pain. Yet surprisingly she did not cry while it was being removed. 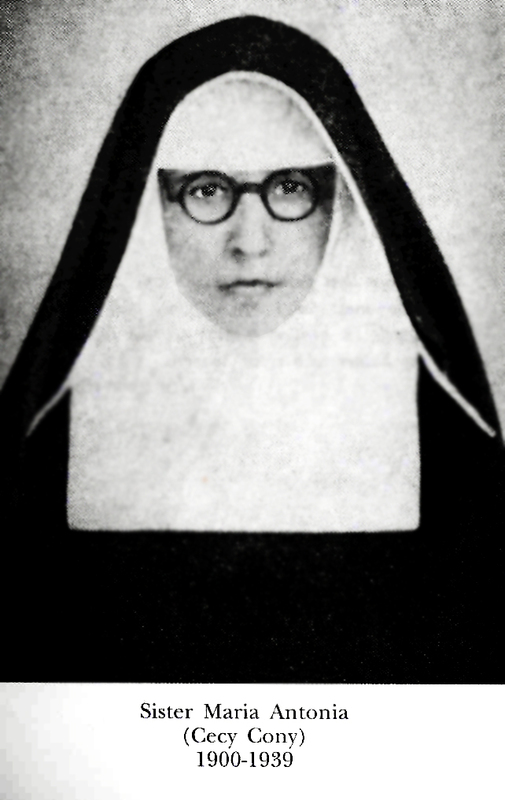 Mother Francis Xavier had instructed Nellie concerning the significance of the crucifix. Here is Mary Long's reminiscence: "The prioress, Mother Francis Xavier Hickey, used to come over to see Nellie every evening. Then Mother would kneel by Nellie, take out her crucifix, and explain Our Lord's life .... "
All this time, tuberculosis was wasting away the baby frame. Not only were Nellie's lungs affected, but her jawbone had begun to crumble away from the disease known as "caries." In the end it came away in pieces, and the odor from it was extremely unpleasant and at times unbearable. The devoted nurse syringed it frequently with disinfectants. This, although it hurt considerably, was nevertheless not once resisted by the child. When the nurse took out her syringe, Nellie took out her crucifix. Giving her intelligent consent to this pain, which clearly God had laid upon her, she thought of the Great Atonement. When the pain was greatest she used to lie motionless in bed, her arms crossed on her breast, her little fingers folded around her crucifix. As we can see, little Nellie's devotion to whom she called “Holy God” was extraordinary and heroic, while at the same time being very simple and childlike, given that she was only 4 years old. "How are you today, darling?" asked nurse Hall. "I thought that you would have been with Holy God by this time." "Oh, no!" answered Nellie, "Holy God says I am not good enough to go to him yet." Nurse and the Sister looked at each other in amazement. "Where was He, Nellie?" asked the Sister. "Dere," she repeated confidently, pointing to the same spot. "And what was He like?" asked the Sister again. "Like that," answered Nellie, putting her hand on her breast in a tucked position. Sister Immaculata and Nurse Hall were naturally astounded at this revelation. Was it a childish fancy or had God really favored this little child as He had favored other chosen souls? After some discussion, they both agreed that it would be more prudent not to mention the matter to anyone, unless Nellie herself should speak of it again. And one day little Nellie, when on the threshold of eternity, solemnly repeated the story of this visit of “Holy God”. And for a child of four years, Nellie was making incredible strides in faith and holiness. She had learned by heart the morning and evening prayers, the acts of faith, hope and charity, the principal mysteries of religion, and much of the story of the life of Jesus. 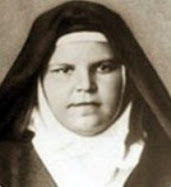 She had a remarkable devotion to the Passion of Our Divine Lord, and when they exhorted her to unite her sufferings with those of Jesus, she seemed to grasp the idea immediately and was quite prepared to make the heroic sacrifice and to endure the most atrocious suffering without a murmur of complaint. She kept a crucifix beside her on her bed, and when her sufferings became almost unbearable, she would take it in her little hand, stare at it fixedly, and whisper, "Poor Holy God! Oh, poor Holy God!" If others sympathized with her, she would smile and remark, "What is it compared with what He suffered on the Cross for me?" 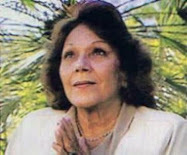 She prayed often during the day, and her recollection during prayer was very edifying. She prayed for all who were dear to her- the Sisters, the Bishop, the Nurses, her little companions, the welfare of the Church of Christ and the Pope. Nellie's recital of the Rosary was particularly edifying. She kissed each of the large beads and the crucifix and recited each prayer slowly, distinctly, and with a spirit of recollection most remarkable in one so young. "'Say the Rosary, Mudder,' she answered. I had only said a few Hail Marys when I heard her whisper, 'Kneel down, Mudder.' I paid no attention and continued to the end of the first decade, when she repeated in quite a determined tone, 'Kneel down, Mudder,' and I had to finish the Rosary on my knees." 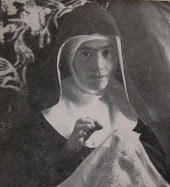 Not long after Nellie was completely bedridden, she expressed a strong desire to be carried down for Mass to adore Jesus in the presence of the Blessed Sacrament, and what's more she soon expressed sighs of longing for the then unheard-of privilege in childhood of receiving Holy Communion. During this time, the normal age for first Holy Communion was at least age 12. Often now she was heard repeating to herself: "Oh, I am longing for Holy God! I wonder when He will come! I am longing to have Him in my heart." All the while, Reverend Mother continued visiting Nellie every evening. On one occasion, when about to bid the child "Good night," she was startled by the following request. "Mudder," asked Nellie, "tomorrow morning, when you get Holy God, will you bring Him up to me?" Mother knew not what to answer. She considered for a moment and then replied, "Tomorrow morning I shall ask Holy God to be very fond of you, and I shall come up to see you after Mass." This reply seemed to satisfy the child. Later in the evening she called Nurse Hall and said to her, "Mudder Prancis is going to bring Holy God to me in the morning”. What was her disappointment after Mass when Mother Francis came to see her, but without actually bringing her Holy Communion! 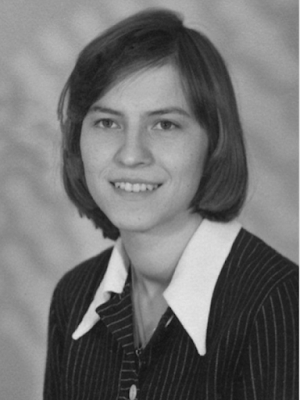 In fact when she saw Mother Francis enter without "Holy God," her disappointment was so keen that she wept bitterly. "No, I am just thinking about Holy God." Soon, however, the clever little brain had evolved a plan which might solace -though it could not satisfy her longing for Holy Communion. "Mudder," she whispered to the nurse one morning, "when you get Holy God in the chapel, will you come back and kiss me? Then you can go back to the chapel again." This kiss was not for the nurse, it was for the Blessed Sacrament. It was given indiscriminately to anyone, nun or child or grown-up, whom Nellie could coax to come to her immediately after their receiving Holy Communion. In profound reverence the baby lips would touch the lips of the communicant, then in strictest silence she would wave her tiny hand as a signal to the other to return and finish her thanksgiving. Sometimes her nurse would hesitate to leave Nellie to attend Mass, but Nellie would always insist. "Mudder, go down to Mass," she would say, "and get Holy God and come back to kiss me. Then you can go back to the chapel again." The whole month of November 1907 passed thus in holy desire, in suffering patiently borne, and in loving thoughts of Jesus in the Blessed Sacrament. As December came, the Sisters had begun a ten-day retreat which was to end on December 8, the Feast of the Immaculate Conception. Fr. 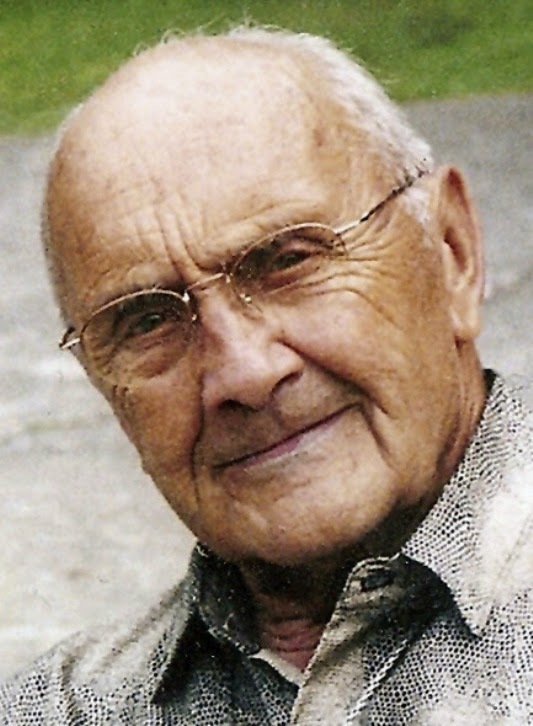 Bury, S.J., was the director. Naturally, the Sisters mentioned to him the longing for Holy Communion of the "extraordinary child" upstairs. Nellie was only 4 years old, and at this time children generally were not admitted to Holy Communion until ten or twelve years of age. Father Bury, far from dismissing the Sisters' account, gave his sympathetic attention. "St. Alphonsus," he said, "gave Holy Communion to a tiny child who longed for it. If the Bishop permitted me, I would do the same by Little Nellie." So that day Fr. Bury went up and had a talk with Nellie. "What is the Blessed Eucharist?" he asked. Nellie's reply was all her own: there was not a touch of coaching or catechism about it. "It is Holy God," she lisped; "it is Him that makes the nuns and everybody else holy." On another occasion she would say, "Jesus comes on my tongue and goes down into my heart." The words were indeed the words of an infant, but the doctrine was profound. Impressed by the reasoning of Nellie, Father Bury wrote a letter to the Bishop requesting special permission to give her Holy Communion. According to Father Bury, "With regard to the reception of this Sacrament, Nellie had arrived at the use of reason." He told the Bishop that Nellie was endowed in no ordinary degree with ardent love of God and the desire to be united to Him in Holy Communion. The answer came while Father Bury was dining in the convent parlor. No sooner had he read the permission than he started up from his unfinished meal, flung his napkin halfway across the table and rushed upstairs two steps at a time to take the joyful news to the anxious little one. When Nellie heard the glad tidings, her joy was indescribable. "I will have Holy God in my heart!!! I will have Holy God in my heart!" she kept repeating with indescribable joy! The night before her First Communion day brought Nellie little rest; she could not sleep for joy. She kept Nurse awake all night long, asking if it were not yet time to rise. "The stars are gone, Mudder!" she would cry, "' is it time to get up now?" The eventful morning dawned at last, the morning of December 6, 1907. After such a sleepless night it was feared the excitement would be too much for the delicate child and that she would be unable to receive the Blessed Sacrament. But Nellie tried to calm herself; she lay quietly in her bed, and though her limbs trembled slightly, the illness passed. It was the First Friday. Dressed all in white, she was carried down and placed in a little easy chair before the Sanctuary. The community Mass had just ended. Nellie remained silent and motionless with her head bowed down in prayer and adoration. Every eye was on this baby of predilection; all her companions looked on in wonder. A baby to receive Holy Communion! Then came Father Bury in stole and surplice. Soon she saw the priest approaching, she lifted her eager face. "The child," wrote Father Bury, "literally hungered for her God, and received Him from my hands in a transport of love." So all of Nellie's yearnings were satisfied. Holy God had come into her heart at last. A priest wrote in October, 1911, describing Nellie's thanksgiving after her First Communion. "The happy moment will long be remembered by those who had the privilege of being present. Nellie seemed in an ecstasy, and all remarked the heavenly light that lighted up the child's countenance." "May God enrich with every blessing Father Prevost and all who recommend frequent Communion to young boys and girls, proposing Nellie as their model"
The New Year 1908 dawned, but it brought no earthly hope to those who loved little Nellie. It was a wonder to all how she continued to exist: the tiny frame was quite exhausted. She could now retain nothing, not even a spoonful of broth. She seemed to live on the Blessed Sacrament alone. Her sufferings were so great that one day they drew tears from a Sister who witnessed them. But Nellie was quite resigned. "Why are you crying, Mudder?" she asked. ''You should be glad that I am going to Holy God." If her nurse complained of a headache or other pain, Nellie would say, "What is that compared to what Holy God suffered for us." On another occasion one of the nuns went to Nellie and begged her to pray for a sister of hers, a lady in the world, who was very ill.
"Has she children, Mudder?" asked this astounding infant. "She has many children," replied the Good Shepherd Sister, quite gravely. "Then," said Nellie confidently, "I will pray to Holy God, and He will see that she'll be cured." And, in fact, the lady recovered. Nellie loved holy cards and medals, and would have them placed all about her room and her sick bed. One day Mother Superior showed Nellie a new holy card of Jesus. She responded “that is not the way that I see Him”. "How do you see Him?" asked Mother. "This way," answered Nellie, holding her hands on her breast in the same manner as on the occasion when she had spoken of her vision to Sister Immaculata and Nurse Hall. Mother was astonished; she had not heard ofthis "visit of Holy God" before. She spoke to the Sister and the Nurse, and they gave thanks to God. Their lips were opened now, and they disclosed their treasured secret. Nellie had been asked to pray for the recovery of a well-known Jesuit Father who was unable to come to Cork because of a serious illness. "Holy God is very fond of Father" she said a few days later. "He will get better, but he will never see me." Her words proved true. During the month of January the little patient lingered on, enduring her sufferings with heroic fortitude. Fr. Scannell says that "days of torture glided into weeks of agony, until sympathetic hearts would pray that God might take her." 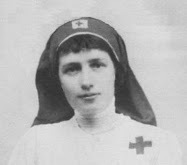 Nellie said that she would go to Holy God on His own day (Sunday); that she would wear her First Communion dress, that she would go in Nurse's arms, and that they should make a new dress for Nurse. Rosary tickets for the month of February (1908) were distributed by lot among the children, and Nellie in her turn drew hers. It proved to be that ofthe Feast ofthe Purification, February 2, which was to fall on the upcoming Sunday. Would that be the day? On Friday Nellie was so weak that it was thought she had already passed away, but again she rallied slightly. She passed an agonizing night. 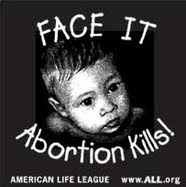 On Saturday the little sufferer hung between life and death. All day on February 2, poor little Nellie's agony was heartrending to behold. Several Sisters came in turn to kneel in prayer around the little bed; three remained, becoming witnesses of Nellie's saintly death. Toward three o'clock Nellie became quite calm, and she remained motionless for about an hour. Her eyes were fixed on something which she seemed to see at the foot of her bed. "There was an extraordinary look in those lovely eyes," a Sister related; "it was not the sightless, glazed expression of the dying." Then Nellie moved. Her eyes now filled with tears-with tears of joy, it seemed. She tried to rise and draw near to that "something" on which she was gazing so longingly, and then she smiled. From the movement of her lips it seemed she was speaking with someone, and raising her eyes, she followed with a look of supernatural love that "something," which seemed now to hover above her head. Presently, with an ecstatic smile, little Nellie "flew" to Holy God. It was four o'clock on Sunday, February 2, 1908, the Feast of the Purification of Mary and of the Presentation of the Child Jesus in the Temple (Candlemas Day). Nellie was then four years, five months and eight days old. Nellies body was laid out on the bed which had been her cross, clothed. in her First Communion dress and wearmg the wreath and veil and her dainty little shoes. Around the bed were placed the pictures, medals and other objects of piety which she had loved so much in life; all these became precious relics. In the morning, the little coffin was carried to the chapel and laid in the children's choir. Then, after the Requiem Mass, the Sisters and the pupils came to bid a last farewell. They touched the little hand with rosaries and medals and reverently kissed the body that had housed a soul so dear to God. She was buried in the evening in St. Joseph's cemetery. The mourners were few: Nellie's sister Mary, who was still a pupil at St. Finbarr's School; Nurse Hall; Sister Teresa and some of the pupils. However as time went on the story of the remarkable life of that holy child spread among the public, the little grave in St. Joseph's Cemetery gradually became a shrine. The graces obtained through her intercession were by degrees divulged, and the resting place of this little child became celebrated throughout the country. It was now sought to have the remains transferred to the Convent Cemetery at Sunday's Well. Exactly a year and a week after little Nellie's death, the grave was opened to see if such transference could with safety be accomplished. "There were present a priest (this was Fr. Scannell himself), the Nurse, and two other reliable witnesses. To the great astonishment of all, for it must be borne in mind that the child had died of phthisis (a wasting or consumption of the tissue; usually, pulmonary tuberculosis) the body was found. intact, except for a small cavity in the right jaw which corresponded to the bone that had been destroyed by caries whilst the little one was still alive. The fingers were quite flexible and the hair had grown a little. The dress, the wreath and veil of First Communion, with which she had been buried as she desired, were still intact. The silver medal of the saintly child of Mary was bright as if it had been recently polished; everything, in fact, was found to be exactly as on the day of Nellie's death." The permission of the authorities, civil and ecclesiastical, having been obtained, the body was transferred from the public cemetery to that of the Good Shepherd Convent, where it was piously laid on the 8th of September, 1909. Father Scannell finishes his report "The new grave is visited by groups of pious persons who ask that little Nellie may plead for them before the throne of the All-powerful God. The blind, the deaf, the lame, those in suffering or in sorrow, seek health and comfort at this peaceful holy shrine." 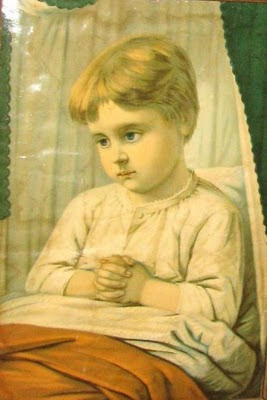 And those seeking the intercession of “Little Nellie” have not sought her help in vain as countless miracles have been wrought through her heavenly intercession in the 100 years since her death, and good number of these testimonies have been kept by the Good Shepherd Sisters as a living witness to her care and concern for those who pray for her help. Little Nellie of Holy God, pray for us! 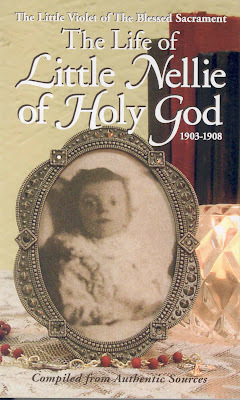 Primary source for this article is firstly the excellent book entitled "The Life of Little Nellie of Holy God" Tan Books, 2007, available through Tan Publishing here. Front cover shown in the photo to the left. Additional source is the book entitled "Little Nellie of Holy God" by Sister Mary Dominic, R.G.S., Tan Books, 2006, available through Tan Publishing here. I Love Little Nellie. Thank you very much for sharing her story. Happy that others will get to know her. What an inspiration to me how our patron of our church has touched so many...now I know. Thank you! Tears came to my eyes upon reading this amazing account...would that I could be half as good as that child in my devotion. I loved the article and i couldn't hold my tears. Little Nellie of Holy God, Pray for me! Thank you for sharing the story of Little Nellie. I has touch my heart so. How much she loved Holy God. Little Nellie please pray for me. I was moved & touched by her very short HOLY life. Cannot understand the reasoning of the Catholic Church in not wanting to canonize her. Will spread her name to people who are in trouble. Personally it does not matter to me of what the Catholic Church thinks about her Holiness & Miracles, as deep in my heart she will always be a Saint & will pray to her for her Blessing & intervention with Holy God. I too pray that Little Nellie Organ will someday be canonised a Saint, assuming of course that it is the will of God. Regardless she was certainly an extraordinary soul whose virtues and devotion we can all strive to imitate. That was beautiful, I needed to read that. I was married on the feast of the Purification, now I have discovered we have a new little patron. Thank you Lord. Little Nellie is a saint. Thanks for her story. may we also acquire the heart of Little Nellie who longs for Holy God at her tender age till the day she passed. I love this story, but what has kept this child from being canonised a saint? I, too, love Little Nellie. I have my own Little Ellen - who needs the prayers of Little Nellie. I have asked her to help my Little Ellen find Holy God. January 9, 2012 2:38 p.m.
"Let the children come to me. Don't stop them! For the Kingdom of Heaven belongs to those who are like these children." So much love given and shown in such a short life. How much little have most of us given in comparison.. I hope our beloved Catholic Church will make Little Nellie of Holy God a cherubic, little saint. It is important to teach children about God's tender love for them as early as possible. Our Blessed Mother's love for her parents, our Father, our Lord Jesus Christ and the Holy Spirit is not only limitless but began at her conception, and Jesus is the same substance as our Father and the Holy Spirit and loved His Mother from eternity. Following the examples of Jesus and our Blessed Mother, the first lesson all children should learn should not only be the love of his or her parents but also the Burning Love of the Triune God, our Blessed Mother, our Holy Angels and the Communion of Saints for them. God has planted seeds of goodness in all His children and should be nourished as soon as possible by by the Burning Love of God and our loving family in heaven and their parents so they will have robust and healthy roots rooted in God's Limitless Love for all His Children. If we are alarmed when a child's mental development is not developing at a normal pace, we should be more concern about their spiritual development: our ability to selflessly love God and all His children and the virtue of humility which is what our life in exile is all about! I believe that mankind's problem of taking a whole lifetime to painstakingly and slowly learn humility and selfless love for God and all His children has to do with delaying in childhood this lessons as soon as possible. I hope everyone will see the wisdom of teaching all God's children about selfless love and humility at an early age like our beautiful Little Nellie of Holy God who was raised in a loving and holy atmosphere by her humble and loving "Mudders." Little Nellie of the Holy God, pray for all God's very young children especially those who do not have the opportunity that you had to learn God's Buring Love for all His Infinitely children. I am glad to hear of your devotion to little Nellie of Holy God and your appreciation of her heroic virtues. Thank you for your comments! I have to ask, why isn't there a process in place to have her canonized etc.? 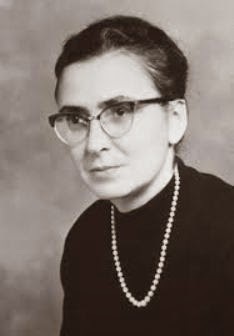 From what I understand, her cause for beatification/canonisation is still at the local Diocesan level, that is, it has not thusfar progressed to Rome. Hopefully she will be canonised someday, if it is God's will of course, because I think she is an extraordinary example of having a dep love for God admist the sufferings and trials of life. I ask the intercession of Little Nellie every day for the adoration program at my parish which is languishing. Even in a good parish, the knowledge and love for Jesus in the Blessed Sacrament has grown cold. I would like to have a holy card, especially a relic holy card, if one could be had. 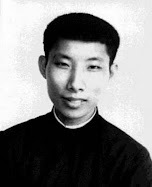 Our Priest, Father Hai, spoke of Little Nellie this morning. I too want a closer walk with Holy God. 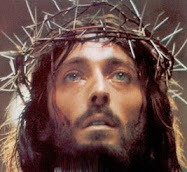 Please intercede for me Little Nellie that my hunger for God continues to deepen and that I serve Him more faithfully. Such a beautiful little girl. I wish more parents would pray the rosary with their children. It is so beautiful and so powerful. I have 3 children, and with my husband we pray the rosary, but Nellie was truly inspiring and so devout for such a little girl. Pray for my children Little Nellie. If they become as holy and devout as you my heart would be so happy. We need more children to have such faith and devotion for God from an early age. I wish more parents would help to do this. It would make this planet a better place. I love her and have a great devotion to her holy life. I read there was a song about her, but forgot what it was called. Does anyone know? It was a communion hymn. After seeing this article on your site I bought the book. It is probably my all time favorite. I only wish it were longer. Thank you for introducing me to her. To speak of 'the British Army then in occupation in Ireland' (second paragraph) is an odd way of putting it. Ireland became part of the United Kingdom in 1801 and remained so until 1922. Nellie's father was not joining an army of occupation, he was simply joining the army. Catherine Here. I am from Ireland and the saddest thing about this whole story, is that the same convent will only be remembered for the abuse of young women within their walls and not the holiness of such a young beautiful child of God. 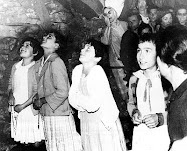 They were all children of God who resided there, but what happened to the nuns. How did they forget so easily that God had visited their home through Nellie on many occasions. The convent burned down in 2005 and just a shell stands there now. I wonder where Nellies is or have people forgot about her. I know this is the first time i have heard about her until i read the story here. 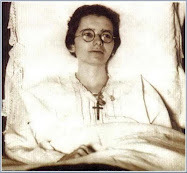 I must check and see if there is a group to have her beatified, because it is very evident that through her intercession to God that people were cured while she was alive. I love little Nellie.I am touch by her perseverance in the face of difficulties.She have thought me to be steadfast in difficult moment.I know that by her intercession,I too will remain steadfast to the end. Thank you very much for sharing her story with me. Thanks for the lovely inspiring story of Little Nellie of Holy God. My younger sister had great devotion to her and I often wondered why. My Sister is now in heaven so I couldn't ask her. But now I know having read your story. Again thanks. May Holy Nellie pray for me and the world. I cannot believe little Nellie is not canonized a saint yet! Nellie please pray for my sleeping problems to go away along with these hot flashes that have plagued my life for years and years to go away.I am always sweating and hot even in very cold weather. and Saoirse says--read the history and understand how Ireland was subjugated and her dad wasn't the only 1 to take the saxon shilling either. I learned about Little Nellie from your web site. I absolutely LOVE the books on her that you recommend. I wish there were more information on her. What a little angel. What a True inspiration Little Nellie was. It was as though she was here to teach not only the Church, but everyone who came in contact with her. She should be canonized as a saint for her pure strength and Love of Holy God. 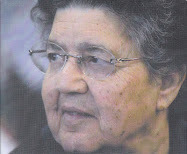 She is now one of the Lords Favorite Angels and a teacher to many of us here. I pray to Little Nellie to bring my family back together and to show that love and faith conquers all. May God Bless us all. 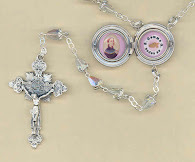 Each time I go to communion I am accompanied behind me on my left hand Little Nellie and on my right hand side by Blessed Alexandrina to assist me in receiving My Lord and Savior into my heart which I ask them to prepare a fitting place for my Lord. Sometimes little Nellie will scold to kneel while praying, I am convinced her time has come to save Ireland from the enemy. I have only just heard about Little Nellie and I am in awe of this child. I am now praying to her for her help to intercede on behalf of my grandson who has to have a biopsy of his jaw and CAT scan on Wednesday 2nd October. Please pray for him little Nellie and ask baby Jesus to make him better. You are already a saint. My love and thanks. My Jerrica was a child that flourished in her love for Jesus, Heaven and the Blessed forgiveness promised to all of us through His blood on the cross. It was not to the extent of Nellie, however people did wonder why Jerrica was such a fervent follower of Christ at such a young age while other kids were doing what most kids do. I pray that Nellie has found my Jerrica and brought her the knowledge that she so longed for in her life of 11 years. Dearest little Nellie of the Holy God, blessed be your presence in Heaven forever to watch over unbelievers and believers of your sweet love for Holy God. You entered my heart with such a sweet tenderness and love you touched my love of God, sharing the purity of your innocence in this world of doubt and evil. You bring the renewed essence of flowers blooming from suffering for Holy God. Pray to Holy God for healing for MaKayla and Brenna and greet baby Jesus for me. We are very grateful to have read the story of Nellie of Holy God. Both my husband and I had tears and were deeply touched by the sweetness and courage of this child and her great Faith. For another story of a Saintly little girl. Please look up "Venerable Anne de Guigne" She was also incorrupt and passed away at the age of ten. I wish I could have the strength in life that Nellie had, just amazed by her bravery, what a wonderful little girl. Let us continue to love and teach the awesome love of the Eucharist.. thanks to little Nellie of Holy God who my mother born in 1917 always spoke of her life. Please pray for me Little Nellie, that i may fulfilling my dream of being a Religious and being espoused to Jesus. I am not Catholic,and somehow stumbled across this story, I was moed beyond words, tears came to my eyes, what a beautiful story to share. A child and her love of God. Wow. I was moved to tears when reading this story! To deny Holy Mother Church's opinion is to cheapen and deny the devotion and love Little Nellie had for Christ, his Mother, and his Bride. Blessed beautiful baby angel Nellie Organ, praise Holy God for giving us this wee saintly child. Her short life glorified God in every respect and her yearning for Jesus in Holy Communion is inspirational. We should all do whatever we can to promote this angel of God by sharing with friends, relatives, everyone around the world, so she can be rightly canonized as a Saint in Heaven. Share your miracles with the Sisters of the Good Shepherd in Ireland so that the path to baby Nellie's beatification can continue. Please intercede for this family, especially for the young children. Does anyone know if little Nellie's cause for sainthood is being advanced? I wrote to Ireland to the address given for her place if burial, but I've never heard back. Thank you. I am so sorry for your great loss. My heart aches for you. I feel confident that your little love is certainly with little Nellie praising God and loving you fervently from Heaven! I was inspired by the story of Little Nellie which I first heard of on EWTN. I was moved to tell the story to a few Priests in 2 Diocese's in USA. Oddly enough 1 Priest in Frankfort, Kentucky responded after I discussed it with him. He included her story during his homily at the Mass of Corpus Christi. He stated that we should all pray for the faith that Little Nellie had in the Eucharist. Interestingly, he told me that he carried a card of Pope PiusX in his pocket during the First Holy Communion ceremony. The parish is named Good Shepherd! I was greatly inspired by Little Nellie's story,this was my first time and i know it will be a great inspiration to my children. Please little Nellie pray for my children to the Holy God to help them understand and yearn for Jesus in the holy communion. Little Nellie of Holy God came to help me in a recent complicated time I was going through in life and work. Her name kept coming to my mind and I kept repeating 'little Nellie of Holy God pray for me' it seemed she was with me, helping me through with simplicity,love and purity.Leading me back to God. I've since sought to find out more about you Nellie.Thank you God for little Nellie's life and the kindness of those who helped her,our kind and wonderful Priests,Nuns and Religious who have inspired and helped us so muchover the years.Forgive us our sins dear Father in Heaven and in your Mercy lead this land safely back to the light of Christ Crucified and Redeemed.May we all be inspired and renewed by little Nellie of Holy God's story of simple love and devotion and in our own lives return immediately to Holy God. I have read this beautiful story before and shared it with one of the Religious Ed. classes that I once taught. Holy Nellie, pray for us and our world! 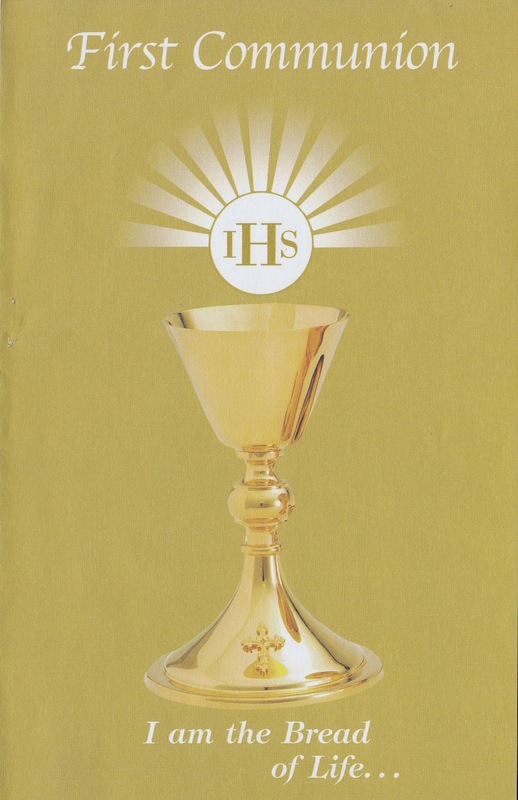 Pray for us to always desire Jesus, especially in the Holy Eucharist. This is a testament I will always come back to. I also hope and pray this child may someday be recognized as the Saint that she is. Thanks be to God for Little Nellie. His Son in the Eucharist. Attended her in her illness. Salvation on a Cross at Calvary. A river known as the Roe. By many as one of the world’s best. The loving grace of their Holy Spirit. Of Sainthood by the Church she loved. Artistic tools well known to you, Aloysius. 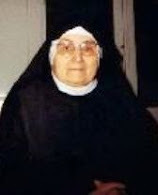 I think it might be a good idea if everyone erected a shrine or little altar in their local Church (with the permission of their Parish Priest of course) in order that Little Nellie of Holy God's beatification and sainthood will happen sooner. She is such an example to us all. What courage the little Wonderful Child had. Thank you Holy Little Nellie of Holy God for being on earth for your short little life and for our benefit. 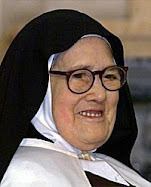 Bless you Little Nellie of Holy God ... we rejoice at the thought that soon we will refer to Saint Nellie of Holy God. Such a beautiful story about a kid with a big amount of suffering. She is very pious and deserves sainthood.